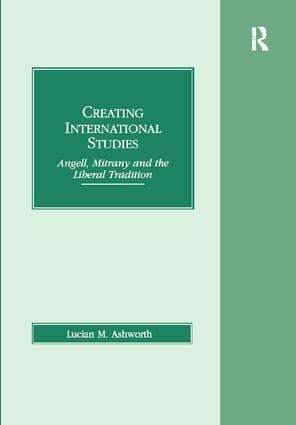 Through a critical evaluation of the works of Norman Angell and David Mitrany, this book explores the liberal roots of the academic discipline of International Relations (IR). Ashworth argues that, far from being the product of timeless realist truths, IR’s origins are rooted in liberal attempts to reform international affairs. Norman Angell’s work represents the first attempt to develop a comprehensive 'new liberal' approach to the problem of global governance, while David Mitrany’s exploration of the problems of international life led him to apply the left-liberal idea of functional government to global governance. Both writers demonstrated the extent to which early twentieth century liberal writers on international affairs had answered the critics of earlier nineteenth century liberal internationalists. The penultimate chapter argues that the realist-idealist 'Great Debate' never happened, and that liberal scholars such as Angell and Mitrany have been unfairly dismissed as 'idealists.' The final chapter evaluates the writings of Angell and Mitrany and claims that the works of both authors can be criticised for theoretical weaknesses common to the liberal paradigm. Contents: Introduction: Liberalism and the emergence of IR; Precursors to Angell and Mitrany: nineteenth century liberal roads to peace; The international thought of Norman Angell: from the great illusion to the public mind; Mitrany and the emergence of the functional approach; The inter-war Realist-Idealist great debate: real or imagined? ; Angell and Mitrany in retrospect: perpetual peace and the problems of reason; Bibliography; Index.